Okay, so the Prix Bedeis Causa were handed out last month, the Doug Wright Awards are being presented this Saturday night, and the Prix Bedelys are going to be presented on June 2nd. 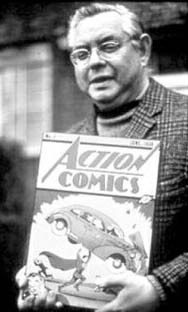 What about the Joe Shuster Awards? Well, they’ll be handed out in late August, and we’re almost finished with the selection process. There will be 3 inductees into the Hall of Fame in 2013. The Nominating Committee for the Dragon Prize and for Webcomics have asked for a little extra time, while the Selection Committee for the Gene Day Award will be picking up some final books this weekend at TCAF to enlarge the pool of nominees. We’ll be announcing the full list of nominees in a press release in late May, unfortunately we missed the Free Comic Book Day deadline I was shooting for. The awards are going to be presented in Toronto this year, in late August – the specific date and venue will be announced later as well. This entry was posted in 2012 Releases, Comics For Kids, General Announcements, General News, Hall of Fame, Nominating, Retailers, Webcomic by Kevin A. Boyd. Bookmark the permalink.